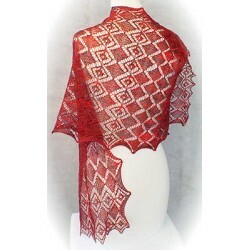 The HeartStrings Faceted Gems Lace Wrap knitting pattern is a testament to the beauty of lace knitting. This wrap is knit lengthwise from one edge to the other in a delicate sculpted lace pattern reminiscent of sparkling gems. Finished Measurements: 18" by 82". Needles: Size 4 (3.5mm) knitting needles, with an additional needle 3-4 sizes larger for binding off. Other Supplies: 23 stitch markers. This pattern includes both charted and written stitch instructions. A great pattern for variegated yarn. Minimum order is only $5.00. See Policies for shipping information. All shipping charges are reviewed and manually adjusted if the system over-calculates package weight. Free U.S. shipping on all orders over $100. Copyright Knit Bin. All Rights Reserved. eCommerce Software by 3dcart.